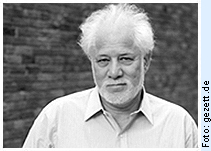 "no taint of the superficial"
Michael Ondaatje was born in Colombo, Sri Lanka (then Ceylon) on 12 September 1943. The poet and novelist with Dutch-Tamil-Sinhalese roots moved with his mother in 1954 to England, and later in 1962 to Canada, where he became a Canadian citizen and has lived ever since. He was educated at the University of Toronto and Queen's University in Kingston, Ontario. From 1971 till 1983 he teached at York University in Toronto, and afterwards at Glendon College in Toronto. He received the Order of Canada in 1988. He is perhaps best known for his Booker Prize-winning novel, The English Patient, which was adapted into an Academy-Award-winning film (9 Oscars). Although he is best known as a novelist, Ondaatje's work also includes autobiography, poetry and film. He has published thirteen books of poetry, and won the Canadian Governor General's Award for two of them: The Collected Works of Billy the Kid (1970) and There's a Trick With a Knife I'm Learning to Do: Poems 1973-1978 (1979). Other important collections of poetry are The Cinnamon Peeler. Selected Poems (1989) and Handwriting (1998). Michael Ondaatje lives in Toronto.